Heavy Weight Bay Corded Tracks from £248 to £351. 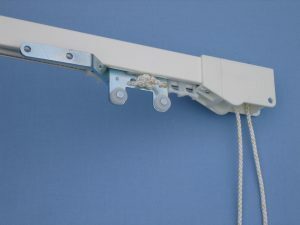 System 3900 for medium to heavy curtains. Prices below are for a two bend bay. Must be fitted by a professional fitter with specialist fitting tools. Available in white only. Face or top fix. Corded either to one side, or from both sides. Can be bent in to and out of a bay window. Very strong and attractive track system. New roller gliders on the rim of the front channel, no dust, minimum friction, very efficient. Domestic & Contract Use. Prices for 4 or more bends in a bay please contact Fit-ex for a price. Please fill in the form below if you are interested in receiving more information about the price, purchasing process or installation of this product. We will respond to your query within 24 hours.